Sandy Felton visits the new Royal Horticultural Society (RHS) Chatsworth Flower Show and discovers an eclectic mix of art, horticulture and the very best of British flowers. 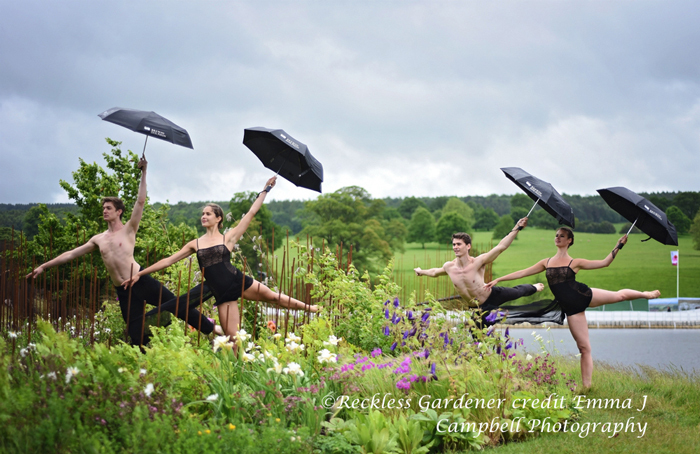 There was a certain frisson and sense of anticipation as we headed for the inaugural RHS Chatsworth Flower Show (7th-11th June 2017). 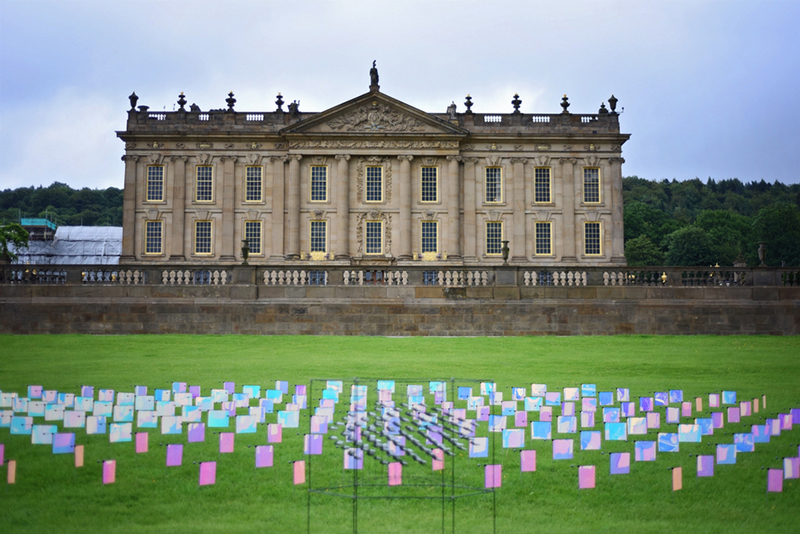 Set against the majestic backdrop of Chatsworth House, in the beautiful Derbyshire countryside, you felt there was going to be something special about it. Sadly, press day was hampered by heavy rain and wind but that didn’t deter from what was on offer and in fact seeing some of the gardens in the wind and rain gave them a certain romanticism you wouldn’t experience in other weather conditions and this particularly applied to Jo Thompson’s Brewin Dolphin and Paul Hervey-Brookes IQ Quarry Garden. 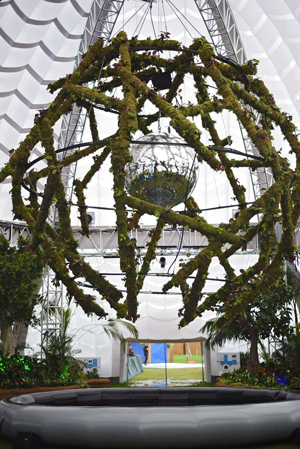 The theme of the Show is Design Revolutionaries, a nod to Joseph Paxton, and as one would expect there is an innovative bias – the un-judged Freeform category being one example to encourage free expression and celebrate the connection between plants, sculpture, art and people. I think this works very well. Of the eight show gardens Best Show Garden went to the ‘IQ Quarry Garden‘ (pictured above and below) designed by Paul Hervey-Brookes (Gold). This is the largest garden at the Show and is simply breathtaking. 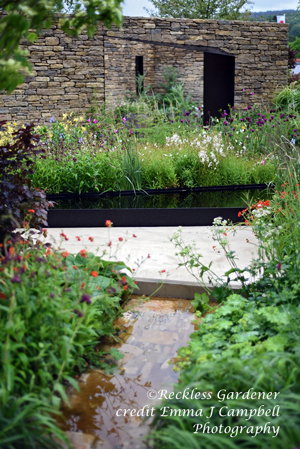 I felt it was one of the best gardens I have ever seen the designer create. He has taken the naked starkness of an old quarry and turned it into a three dimensional masterpiece. 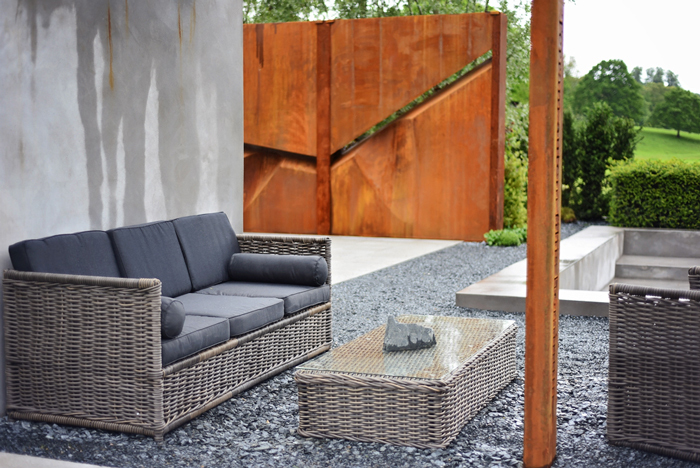 Paul points out that he wanted to create a beautiful space using the life cycle of a quarry, drawing attention to the impressive biodiversity which often inhabits quarries and quarrying landscapes and the unapologetic forms of brutalist design. He certainly achieves that. He uses natural planting such as Teasel, Yellow Meadow Rue, Purple Toadflax and Wild Marjoram and contrasts this against the more contemporary part of the garden which contains a deep sunken area at its heart, evocative of the extraction process. Really stunning and a garden that post Chatsworth will be re-purposed at the National Memorial Arboretum in Staffordshire. One result of the wind and rain on press day was perhaps quite unexpected. The conditions gave a certain romance to the gardens as the wind blew through the loose planting and fluttered the trees. Perhaps other visitors may not have appreciated this but for me it was something of a bonus. The rain washed brutality of parts of Paul’s garden were magical. On Sam Oven’s garden for Wedgwood ‘A Classic Re-imagined’ (pictured left) the rain brought out the drystone walls and on Jo Thompson’s ‘Brewin Dolphin Garden‘ the meadow planting danced in the wind. Jo’s garden is another triumph for her. The FreeForm garden (un-judged) is a spectacular horticultural installation on the banks of the River Derwent. To me, it looked as though it had been there for eons. The trees particularly (Jo used Field Maples and Hornbeams) sat perfectly in the landscape. There are a series of gardens dotted along the impressive steel bars that snake along through the design. Planting is delicate and pretty and in the wind the ornamental meadow came into its own. Jo uses Rosa multiflora to great effect as well as Cirsium ‘Trevors Blue Wonder’ and the wonderful Deschampsia cespitosa ‘Garnet Schist’. 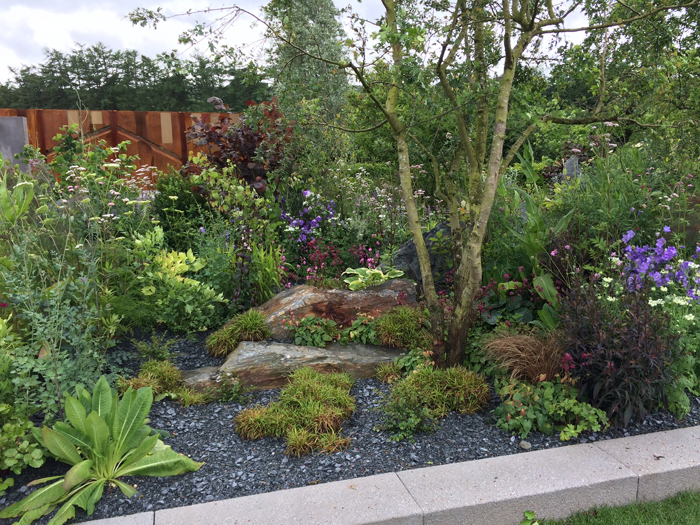 I am a big fan of Jo’s planting and once again she does not disappoint. There is something for everyone in this installation, from peonies, irises and dahlias to natural and calming wildflower meadow planting. All sitting quite happily on the banks of the River Derwent and turning up their noses to the wind and rain – exquisite. 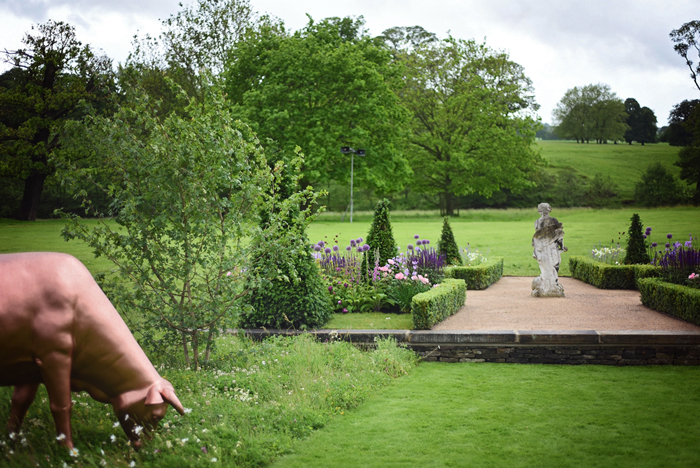 For Jo, designing at Chatsworth has been a delight – she explained that she found the atmosphere calm and relaxing, not to mention the odd visit from the pheasants and ducks. 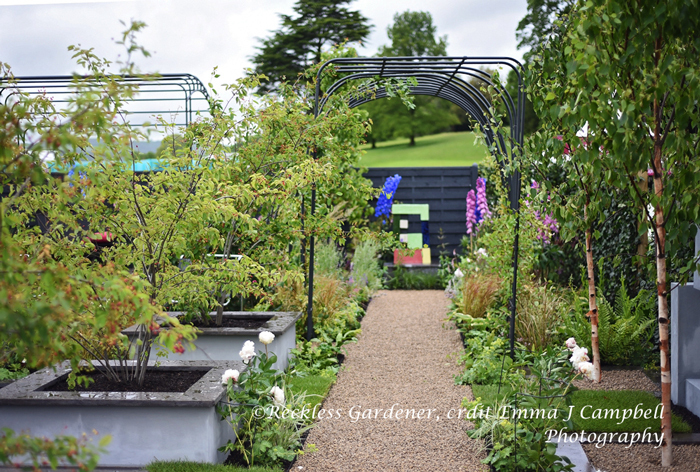 Sam Ovens is the designer of the Wedgwood Garden (Gold) ‘A Classic Re-imagined‘. This is another carefully planted garden and draws its inspiration from Wedgwood’s rich history and its future direction. There are different layers to the design with a clever use of walls to create mystery and creating a central cacoon to blur the relationship between indoors and outdoors. Lots to see in the planting here with Agapanthus, Angelica, Calamgrostis, Deschampsia, Penstemon and Euphorbia all shouting for attention. Beautiful mix of planting in a perfectly proportioned design. The ‘Belmond Enchanted Garden‘ (above) designed by Butter Wakefield (Gold) is one of those dreamy gardens you want to get lost in. This is a naturally planted garden that feels at ease with itself. 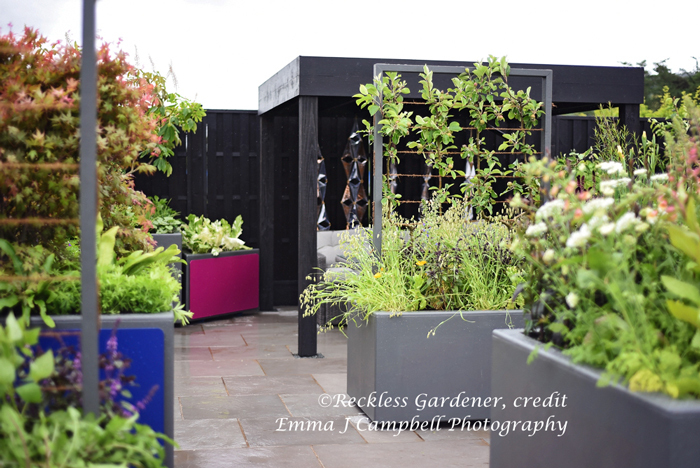 One of the features of the garden is an artistic platform where speakers can share their thoughts and ideas each day. The fence is particularly attractive and the secrecy and intimacy of the garden enhanced by the use of mixed native hedging such as Lonicera, Acer campestre and Hedera helix hibernica. 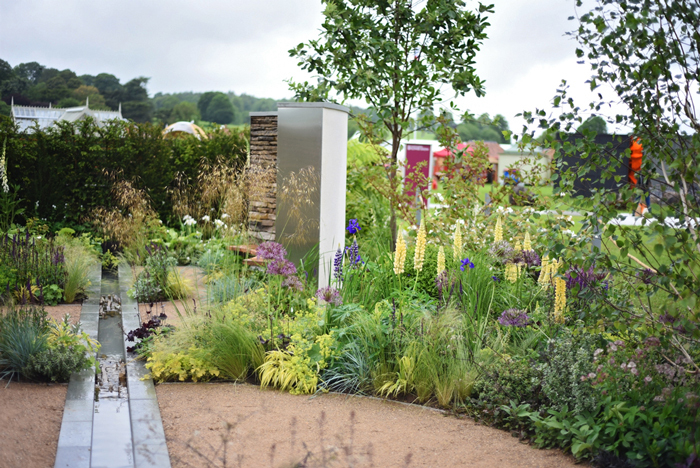 Neil Sutcliffe’s ‘Cruse Bereavement Care: A Time for Everything‘ (Silver-Gilt) is a relaxing garden with an important message. Liked the careful use of stone (especially the curved drystone walls) on this garden and the water rill. Vibrant planting in the central area highlights life around us that never slows yet the garden offers a reflective place to sit. I always like to see a water garden and Jackie Knight’s ‘Just Add Water‘ sits very well in the Chatsworth landscape (Bronze) with its informal planting and gentle cascades. You can’t miss Lee Bestall’s ‘Experience Peak District & Derbyshire Garden‘ (Silver-Gilt) with its life-size cows! Rough grass, native trees and the cows, all representing the Peak District and Derbyshire’s rural landscapes, again perfectly sits in landscape. 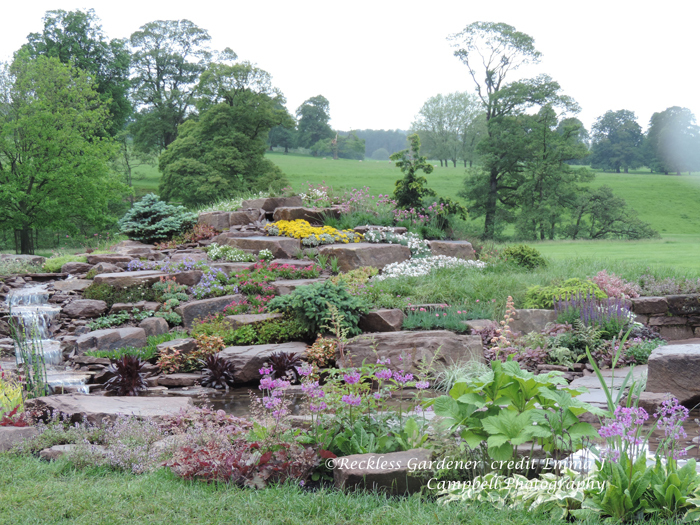 (above) This garden will be re-created at Renishaw Hall & Gardens after the show. I also understand after the show that anyone interested in giving the cows a home can register their interest! The Freeform installations encourage freedom of expression and I think this is one of the most exciting aspects of this new Show and one which I hope will expand in the future. The installations are all un-judged but there is a People’s Choice so visitors can vote for their favourite. I have to confess I did find difficulty in searching out some of the installations, so maybe that is something to look to future planning but the ones I did see were interesting and in some cases impressive. 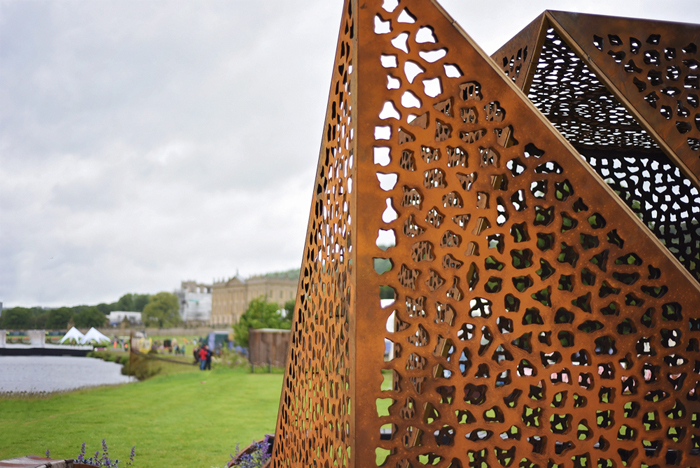 ‘Curves and Cube‘ (above) the collaboration between Gaze Burvill and David Harber stands out. Gaze Burvill created beautiful oak benches curving round trees while David Harber’s imposing ‘Cube’ with its filigree of organic patterns mimicking foliage contrasts with the organic oak curves of the benches. 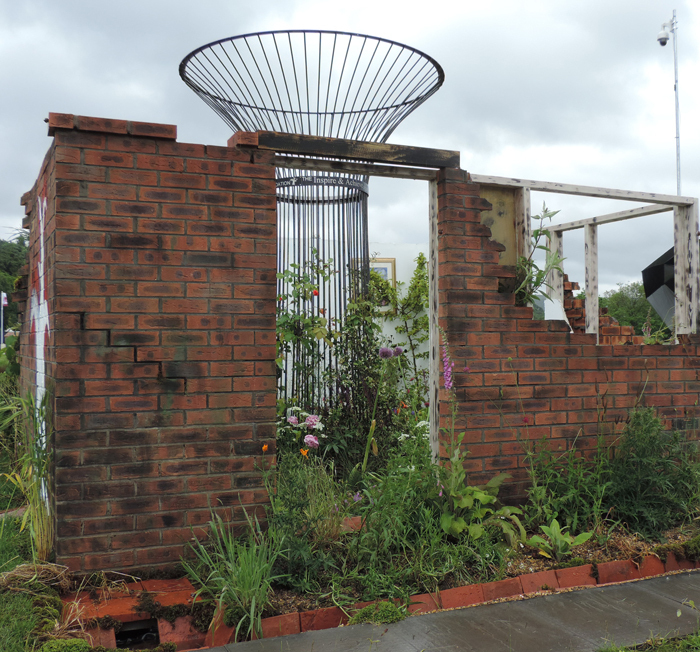 I liked the ‘The Inspire and Achieve Foundation Garden: The Good Within‘, designed by Matthew Fountain and Sean Peel, (FreeForm category- above) is at first glance a derelict building but look within and you find vibrant planting symbolic of the true spirit of the person. The Great Conservatory is a reconstruction of Joseph Paxton’s Conservatory and is at the heart of the show. Somewhat a surreal experience it is nevertheless a space bursting with tropical planting and lots of interesting planting. Finally, I think the Show does a brilliant job at demonstrating all that is best about British floristry with lots of lovely arrangements throughout the showground. Jonathan Moseley’s amazing artistry on the Palladian Bridge is breathtaking. Yes there are teething problems, always are with any new show – I remember the first RHS Tatton and the traffic problems! I also think that the layout of the show could perhaps be better but again this is something that will settle over time. I am sure that RHS Chatsworth will settle well into the gardening calendar and with the magnificent backdrop, the sense of space and the surrounding countryside, become a firm favourite. 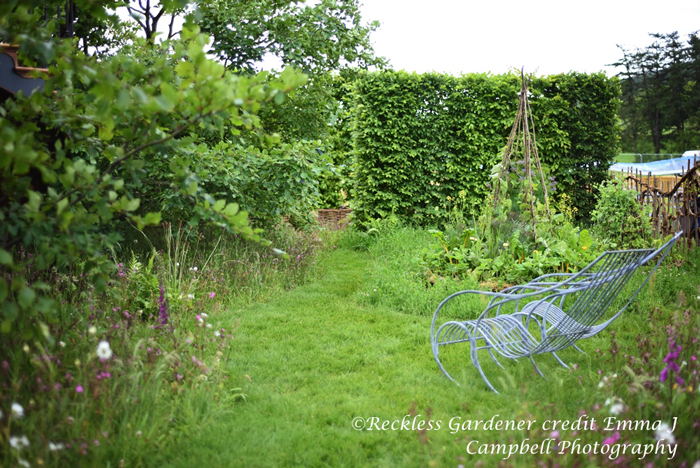 Picture credits: All photographs are ©Reckless Gardener credit Emma J Campbell Photography 2017.